PHOENIX — John Rosenthal, chairman of the Police Assisted Addiction and Recovery Initiative (P.A.A.R.I. ), is pleased to announce that Arlington Police Chief Frederick Ryan and P.A.A.R.I. Executive Director Allie Hunter McDade traveled to Arizona yesterday to speak about P.A.A.R.I., to attend the signing of an executive order that places a limit on first-time drug prescriptions, and to assist the Phoenix Police Department as it implements its own addiction recovery initiative. On Monday, Oct. 24, Arizona Governor Doug Ducey signed an executive order that limits the first fill of prescription opioids to seven days in all cases where the state is the payer. It also caps all fills for children, except for those with cancer, chronic diseases, or a traumatic injury. The signing was part of a kickoff event for National Red Ribbon Week — a national campaign that works to raise awareness about the negative effects drug addiction can have on communities. As part of the event, Chief Ryan spoke at the “Now You See Me” Addiction: The Elephant in the Room event on the senate lawn of the Arizona State Capitol, where he emphasized the importance of ending the stigma of addiction and changing the way law enforcement handles the nation’s opioid epidemic. Instead, Chief Ryan said police departments must look at a modern approach to this issue by removing the demand and helping those struggling with addiction recover from their disease. Since P.A.A.R.I.’s launch less than a year-and-a-half ago, more than 160 police departments and 300 partner treatment centers in 28 states have partnered with P.A.A.R.I. While in Arizona, Chief Ryan also met with members of the Phoenix Police Department, who are working to implement an intake angel initiative in their community. Through this program, residents of the Phoenix neighborhood of Maryvale (West Phoenix) will be able to come into the Maryvale-Estrella Precinct police station, surrender any drugs or paraphernalia and work with volunteers who help place them into treatment to overcome their addiction. That program is now up and running as of Monday. Additionally, on Wednesday, Chief Ryan and Hunter McDade met with a group of 20 law enforcement officials from Arizona to further discuss the Phoenix Police Department’s angel program, and how that model can be implemented in other cities and towns throughout the state in the coming year. 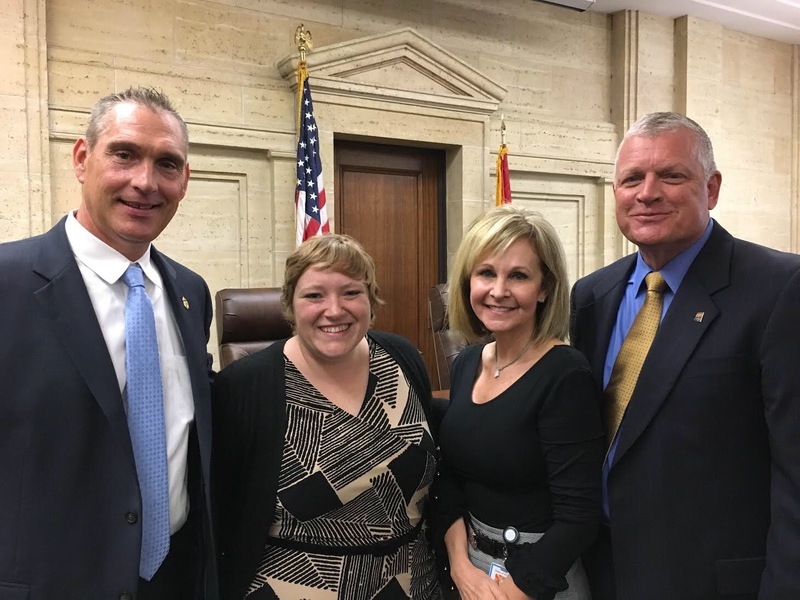 Rosenthal and Hunter McDade would like to commend the Governor’s Office of Youth, Faith and Family for organizing the forum on addiction, and for working alongside Arizona police departments to help facilitate an addiction recovery program in their communities. In just over a year, P.A.A.R.I. has grown into a network of more than 150 police departments across the country and over 200 treatment centers to secure fully-funded scholarships for participants with or without insurance. PAARI is an independent nonprofit organization that supports law enforcement agencies in setting up, communicating and running their own addiction and recovery programs. The police departments, sheriffs offices, and prosecutors who have partnered with P.A.A.R.I. interact directly with members of the public and those seeking treatment, recovery, and resources. Learn more at paariusa.org.